In the year that king Uzziah died I saw also the LORD sitting upon a throne, high and lifted up, and his train filled the temple. Above it stood the seraphims: each one had six wings; with twain he covered his face, and with twain he covered his feet, and with twain he did fly. And one cried unto another, and said, Holy, holy, holy, is the LORD of hosts: the whole earth is full of his glory. And the posts of the door moved at the voice of him that cried, and the house was filled with smoke. These scriptural texts, though not explicitly musical are suggestively so, and they are echoed by liturgical formulas, such as the Preface to the Sanctus that bids the earthly singing of ‘Sanctus’ unite with that of the angels and archangels. These textual foundations of a musical heaven inspired many Renaissance painters to depict angel concerts, sometimes on a splendid scale with an impressive variety of instruments. More intimately, angel musicians are often seen at the throne of the Virgin, where they are captured in the act of tuning, a symbolic evocation of Mary’s role as mediatrix, one who assists in bringing things into accord. Unsurprisingly, Renaissance composers found the theme inviting, as well. In a sense, of course, all settings of the Gloria and Sanctus can be construed as ‘angelic’, an association born of accounts of the Nativity of Jesus and Isaiah’s heavenly vision. But a number of composers were also drawn to texts that were explicitly angelic, such as ‘Duo Seraphim clamabant’, well known in settings by Jacobus Gallus, Francisco Guerrero, and Tomas Luis de Victoria, ‘Angelus ad pastores ait’, familiar in Venetian motets by Andrea and Giovanni Gabrieli, and ‘Angelus Domini descendit’, set by Palestrina, Lassus, and Byrd, among others. Sometimes the compositional link to the sounds of heaven emerges as the fruit of careful interpretation, as in the example of Johannes Ockeghem’s lavish 36-voice canon, Deo Gratias. In 1969 Edward Lowinsky published an imaginative and compelling study that viewed Ockeghem’s unusual work as a mystical angel concert. Drawing on the traditional notions of angels’ musical attributes – the antiphony of alternating choirs, unending song that is always offered in divine praise with unity of voice – he deftly associates these attributes with the Deo Gratias canon. Ockeghem’s contrapuntal colossus combines four nine-voice canons, each sung by one voice part: a nine-voice treble canon overlaps with a nine-voice alto canon, which in turn overlaps with a nine-voice tenor canon, and so forth. 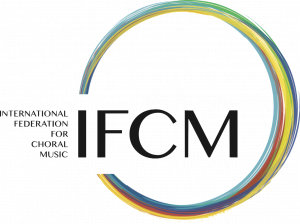 It thus sonically embodies the antiphony of alternating choirs in a musical form – the canon – that is itself inherently circular, and thus potentially unending. Additionally the nine voices of each choir invite an analogy with the nine orders of angels in the celestial hierarchy, as described by pseudo-Dionysius, the Areopagite and others. Lowinsky adds weight to the interpretation by noting the association of a sixteenth-century poem by Nicolle Le Vestu that refers to the canon as a “chant mystique” with a famous miniature of Ockeghem and nine chapel singers. Ockeghem’s choir in the miniature is angelic in its number, and before the singers on their lectern is the music to the equally angelic ‘Gloria in excelsis Deo’. Thus, style, scale, and context combine to shape and reinforce the angelic overtones of the work. One of the most striking examples of an angel composition is Robert Wilkinson’s nine-voice Salve Regina in the Eton Choirbook (ca. 1500). 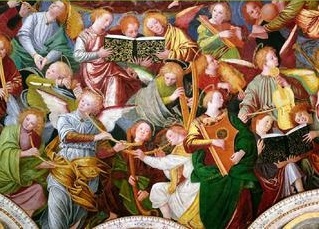 Although the Marian text itself does not suggest an angelic composition, Wilkinson has structurally based his extravagant polyphony on the chant cantus-firmus, ‘Assumpta est Maria in caelum’, and, as Renaissance iconography so amply confirms, the Virgin’s arrival in heaven traditionally found the angelic host offering abundant welcome. Thus, in a musical echo, Wilkinson enshrines Mary of the Assumption in a halo of angelic sound. The intent is explicit in the manuscript. Each of the nine vocal parts is identified with one of the nine angelic orders in decorative, illuminated initials that feature angel musicians bearing the name of their respective order. Written in an expansive style with soaring treble lines and plummeting bass passages, the ‘Salve’ has an unusually wide range of over three octaves. And Wilkinson arranges his vertical soundscape in general conformity with received notions of the celestial hierarchy. Thus at the bottom one finds the angels and archangels; at the very top, dwelling “as it were in the vestibule of God,” are the seraphim, cherubim, and thrones. Traditional attributes of the angelic orders may have also informed his writing to a degree. For example, the chant melody is borne most extensively by the tenor line, identified as ‘Potestates’ (powers). And though not exclusively so, the tenor line for long passages bears the melody in slow-moving, unadorned measure. In his foundational 5th century De caelestia hierarchia, Pseudo-Dionysius describes the Powers as in “possession to the highest possible extent of a certain masculine and unflinching manliness towards all those Godlike energies within themselves.” It is not difficult to sense the “unflinching” quality in the tenor’s steadily held chant melody. Similarly, in one passage (Et pro nobis flagellato…) the cherubic treble line sustains the chant melody, though beneath it other voices from lower in the range – and thus lower in the hierarchy – motivically sing parts of the chant, as well. This passing of the melody downward from the treble is resonant with the description of the cherubim offered by John Scotus Eriugenia, who notes that the “contents of the highest wisdom itself, which is God, are poured out immediately into the Cherubim, whereupon the highest wisdom “flows down through them into the lower orders like a cascading river.” With a little imagination, one might also hear in the brilliance of the seraphic line of the quatreble – an unusually high part with regular ascents to g” – a measure of the fiery quality associated with this order closest to the Divine Light. Certainly the dictates of occasion, patronage, and practicality are of the highest influence in the genesis of Renaissance Masses and motets. It is important to realize, however, that on occasion inspiration seems to have been ‘heaven-sent’, as well, with the choir of angels both messenger and guide. “Sermon Four on the Holy Angels,” in Angelic Spirituality, ed. Steven Chase (New York: Paulist Press, 2002), 151. For a classic study, see Emanuel Winternitz, ‘On Angel Concerts in the Fifteenth Century: A Critical Approach to Realism and Symbolism in Sacred Painting’, in Musical Instruments and Their Symbolism in Western Art (New Haven: Yale University Press, 1979): pp. 137-149. Examples of the depiction of angel concerts abound, including Fra Angelico’s splendid paintings of the ‘Coronation of the Virgin’ in the Galleria degli Uffizi (Florence) and the Musée du Louvre (Paris), as well as his ‘Death and Assumption of the Virgin’ in the Gardner Museum (Boston), and the Master of the St. Lucy Legend’s ‘Mary, Queen of Heaven’ in the National Gallery of Art (Washington, DC). Less well known, but a particularly clear example of theme is the anonymous 16th-century Spanish “The Fountain of Life” in the Allen Memorial Art Museum (Oberlin). “Ockeghem’s Canon for Thirty-Six Voices: an Essay in Musical Iconography” in Essays in Musicology in Honor of Dragan Plamenac (Pittsburgh: University of Pittsburgh Press, 1969): 155-80; rpt. in Music in the Culture of the Renaissance & Other Essays (Chicago: University of Chicago Press, 1989): 278-288. The circularity is not only an embodiment of unending song, but also resonant with circular images that emerge in the medieval descriptions of angels. For instance, John Scotus Eriugena, in his Expositiones in ierarchiam coelestem writes that “all things are said to encircle the highest good that have been created from it, since the highest good is also the inmost good, around which all creatures have been arranged, not in local motion, but in their particular, cosmological order.” In Angelic Spirituality, 170. Cf, for instance, Francesco Botticini’s “Assumption of the Virgin” in London’s National Gallery of Art, where the nine-fold celestial hierarchy in three groups of three encircle the ascendant Mary in profusion. GB WRec 178, fols. 26v-29. Pseudo-Dionysius the Areopagite, quoted by John Scotus Eriugena in Angelic Spirituality, 177. The Celestial and Ecclesiastical Hierarchy of Dionysius the Areopagite, trans John Parker (London: Skeffington & Son, 1894), 31. Emphasis added. In Angelic Spirituality, 174. Next Post: Why should ICB be on line?